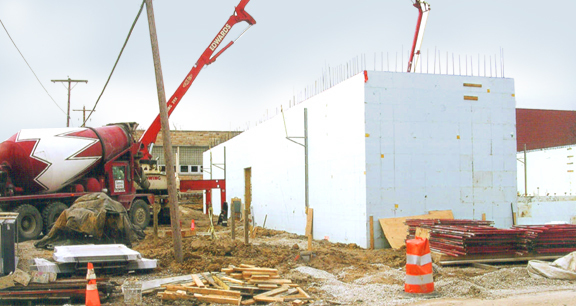 Project obstacles and solutions: The St. Peter and Paul School was the first Insulated Concrete Forms (ICF) school project in the state of Indiana. ICF projects are heralded for their green building value. They produce a superior concrete wall that is well insulated to reduce heating and cooling loss. They also greatly reduce construction waste, since the forms stay as part of the permanent structure. IMI is no stranger to ICF construction. Traditional mix designs can be a problem when building ICF walls, especially when consolidation does not happen properly in the form. IMI worked with Empire Contractors to produce a special wall mix that was easy to pump, was self-consolidating and self-leveling. IMI supplied 400 yards for the walls and another 900 yards for the floors. The result was a structure that met the green building requirements desired by the customer and helps reduce their operational costs in energy savings.